I recently screened Eric von Stroheim's first talking motion picture -- THE GREAT GABBO. 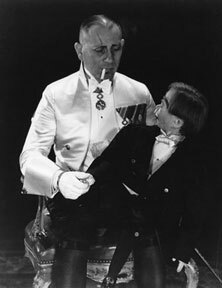 Produced in 1929, just prior to the onset of The Great Depression, von Stroheim plays the title role -- an egotistical ventriloquist who uses his dummy, Otto, as his primary means of expression. As he relies more and more on his wooden puppet the increasingly delusional Gabbo starts exhibiting dangerous irrational behavior. I don't want to give away the entire ending; suffice it to say that something happens that causes Gabbo to go completely insane in a dramatic climax. Yesterday I witnessed the resignation of Presidential Press Secretary Scott McClellan. This wooden dummy has yet to be replaced. Of course, it really doesn't matter who the new mouthpiece will be -- I feel a great depression on the horizon.